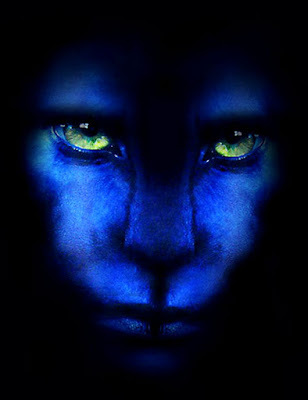 The difference is that Avatar's 3D innovations are hi tech and you need special glasses to see them. Kandinsky's innovations came from a spiritual 'back to basics' approach to color and line, combined with some special fx already built into the human brain (optical illusions like chromostereopsis). You don't need special glasses to see Kandinsky's spatial fx. You just take a good look at the paintings, but of course it's not as spectacular as Avatar's smurfs..
First a bit of 3D history for the right perspective... 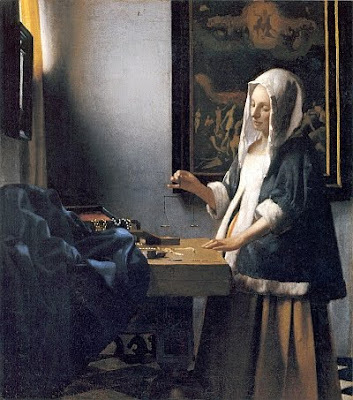 In a classical painting like a Rafael, a Rembrandt or a Vermeer there's always a 3D-illusion, painted on a flat canvas. 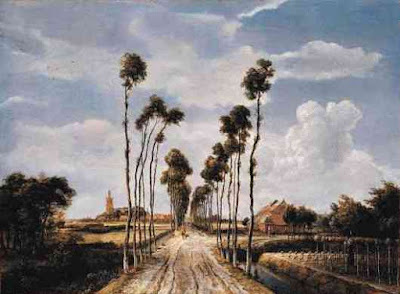 Classic painters use perspective, shadows, colours etc. to trick the brain and make the visual illusion of depth and space as convincing as possible. 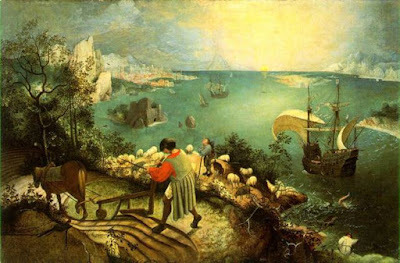 And then there are artists like Brueghel, Salvador Dali and M.C. 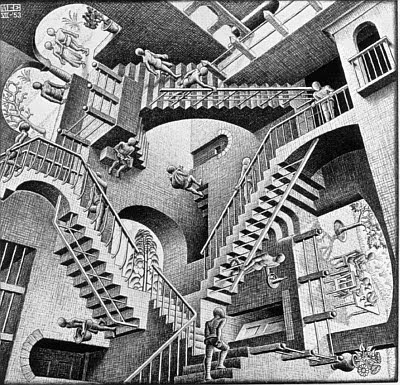 Escher who prefer interesting spaces to realistic spaces. Kandinsky's idea of spatiality in a painting was quite different. After a lot of thinking and staring at blank canvasses Kandinsky decided to forget about the laws of perspective. 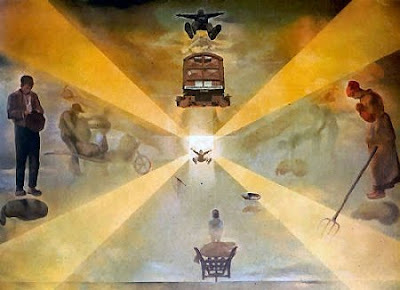 He also gave up the idea of a painting as a framed illustration of reality. He tried instead to create a 'right here right now' kind of experience. A painting as a thing in itself, not an illustration but the equivalent of reality. This style of painting is now known as non representational or 'abstract' but Kandinsky preferred to call his approach 'concrete'. 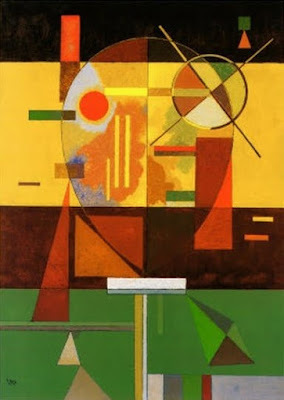 In Kandinsky's concrete paintings the effect of 3D space is not produced using the perspective trick, but first of all by inherent spatial properties of colors and lines (and of course by the canvas size). 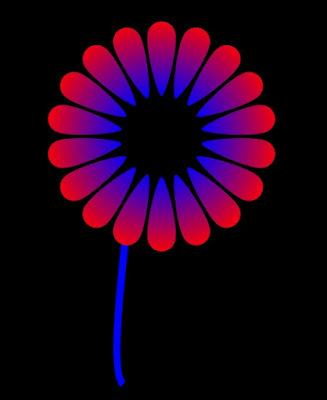 Here's an example to give you an idea of the spatial properties of pure color, this effect is called chromostereopsis. But there's more to concrete painting than space and color. In his most demanding theoretical work Point and line to plane (1926) Kandinsky also says some deep things about the 'hidden' properties of a blank canvas (the picture plane). For example, he notes that the relative weight of an element depends on it's place on the canvas. A dark circle will be very heavy if it's placed at the bottom but much lighter if it's close to the top. 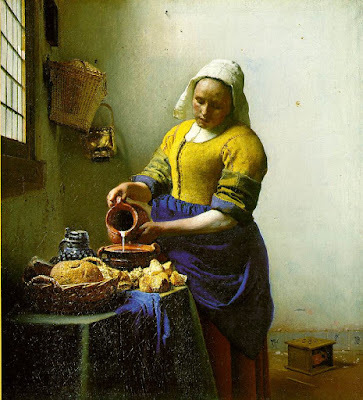 This is one of the reasons why this famous painting is balanced so well that even synaesthetes like it. Compared to music it's perhaps a bit like saying you can only have a few bass kicks in one bar, but you can have lots of hi-hat strokes in that same bar without losing the balance. Psychological or esthetical laws of this kind are the sort of thing that Kandinsky researched, wrote about and taught at the Bauhaus. A lot of this stuff is hardwired into the brain and therefore it's a good starting point for artistic ideas. If you want to create certain experiences it helps to have an idea of the way sensory perception works. It's probably just as important as intuition. Nierendorf: People often say abstract art no longer has any connection with nature. Do you think so too? Kandinsky: No! And no again! Abstract painting leaves behind the 'skin' of nature, but not its laws. Let me use the 'big words' cosmic laws. Art can only be great if it relates directly to cosmic laws and is subordinated to them. One senses these laws unconsciously if one approaches nature not outwardly but inwardly. One must be able not merely to see nature but to experience it. As you see, this has nothing to do with using 'objects'. Absolutely nothing! 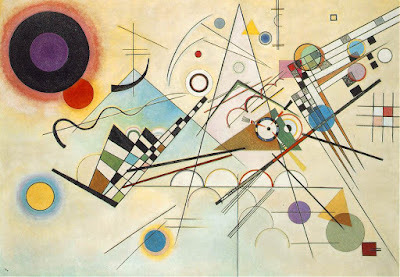 Kandinsky was philosophic and systematic about his experiments and writings, and as a true mad scientist he even tried to construct a grammar of abstract painting in Point and line to plane, just like the Russian composer Joseph Schillinger wrote a grammar of music, some 10 years later. 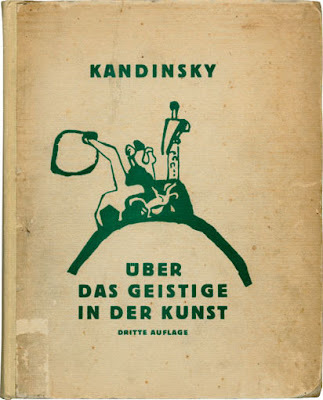 Back to spatiality: in his first book called Concerning the spiritual in Art (1910) Kandinsky had already analyzed some of the effects of color. He had noted for example that yellow and blue have opposite spatial effects. Yellow moves towards you, blue backs away. In music and sound there's again a very similar effect: high frequencies can be close like a whisper in your ear but muffled sounds are far away like a distant thunder or church bell. This is basics for sound engineers. It's possible to create a 3D mix without using any kind of reverb, echo etc. Filters and eq are enough to create depth. It's like a 3D painting without the perspective trick. In practice a totally dry mix (no reverb or echo) works best for electronic music. 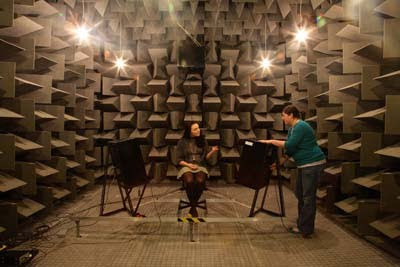 It's also possible to record live music in an anechoic room, but the completely dry sound of a chick singer with an acoustic guitar is very unnatural (usually in an unpleasant way) because we're not used to it. On the other hand a dry, properly equalized 808 drummachine + some synth bleeps can sound very cool. This 100% dry mix can turn mere 'sound' into an almost tangible sonic sculpture. The effect is used in many different styles and variations. For example, if a dry mix also has some continuous background sound, like a stream of noise or a non-stop repeating sample or a static drone, it becomes even more autonomic and air-tight. Like musical sound and space captured in a cocoon. This has to do with the fact that the brain is only mildly interested in static sounds. We always focus on dynamic, modulated sounds (Darwinian survival thing). And because of this, a continuous noise or drone becomes a kind of pseudo-silence and has the effect of a static 'frame' around the mix, making it sound a little more coherent as well. The use of this autonomizing effect is most common in techno and minimal styles of dub. On the other hand, if a mix doesn't have continuous background noise, but is clear and crisp and open, the sound reaches out and fills the room in a very different way. Ok, back to the creation of depth in a painting using color. 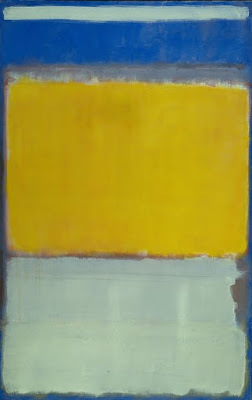 In his book Concerning the spiritual in Art Kandinsky says even more about the effects of yellow and blue. He says that yellow moves outward (eccentric) while blue moves inward (concentric). If you look at two circles of equal size, one yellow, one blue, the yellow one will appear to be bigger because of the eccentric movement. Painters use the various effects of the yellow/blue contrast all the time. to any Gabber tune: there's a big difference in feeling but also in rhythmic structure. Gabber music, like all types of Teutonic techno, military marching music etc. relies on a beat with very heavy accents on the odd counts (1, 3 etc.) while funky music has accents on the even beats (2,4 etc.). The feeling of a funky (more even and syncopated) rhythm is moving eccentric (outward) and the feeling of a rhythm that's completely on the one (odd) is moving concentric (inward). Other rhythmic styles like salsa, samba and reggae are somewhere in the middle, mixing up odd and even accents. That's why these styles can make you feel like you're moving forward and backward at the same time, which is great because the whole idea of dancing is moving without going anywhere. It's no surprise that Let's play house (the Humpty Dance) is on Trombipulation, which is Parliament's last and slightly out-of-control sounding album. And of course Gabber had a relatively short popularity peak compared to dance styles based on a more balanced mix of rhythmic flavors. Ok that's it. Next time we'll talk about Kandinsky's impossible, paradoxical 3D spaces and see if there's a relation with the dubscapes created by King Tubby, Scientist and the Mad Professor.